Quality luggage is hard to find. There are hundreds of bags available on the market today, many of which break down after just a few uses. When it comes to travel high quality luggage cannot be underestimated. We have combed through the enormous selection of available luggage and selected brands and models that make travel easier, lighter, and more convenient. The Samsonite-Spinner-Expandable-Wheeled suitcase is a large suitcase build for heavy use. It is large enough that it is important to be cautious of how much is packed, if you need to make the weight restrictions for an airline because it is easy to over pack. The filament polyester fabric is backed with air expanded polyethylene creating a very light suitcase making for easier portability. The lightweight suitcase allows you to pack more belongings, while still keeping the overall weight down. The Samsonite-Spinner-Expandable-Wheeled suitcase comes in red, black, charcoal, and purple and is 30” X 20 inches. 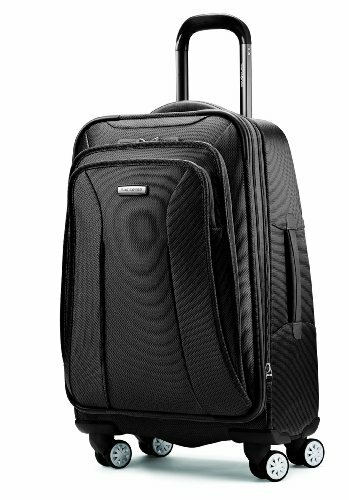 One of the best features is the luggage has four multi directional wheels. This allows for 360 degrees of upright rolling. The ultra-light weight suitcase has a beveled alloy pull handle for easy mobility. It also includes both top and side carry handles. The interior of the suitcase is fully lined. There is also a front panel pocket for additional storage. The Samsonite-Luggage-Hyperspace-Expandable-Suitcase comes in three different sizes. It comes in a 21.5 inch, a 26 inch and a 30.3 inch model. Select the model that best meets your traveling schedule and size. The luggage is made of 70% nylon and 30% polyester. 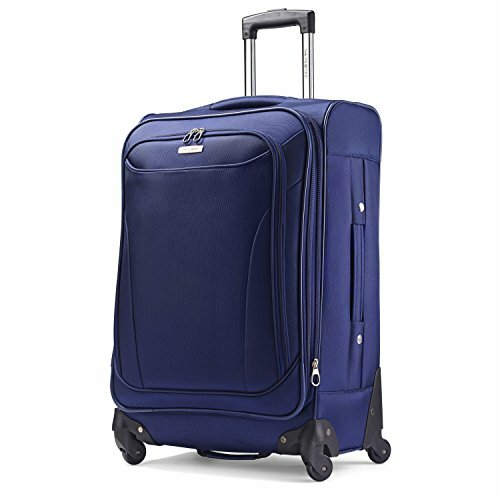 This lightweight luggage has 4 dual spinner wheels for effortless mobility. It will roll through an airport with no strain on your hands or arms. The ergonomic pull handle has a comfort grip. It also includes top and side handles for easy lifting. The Samsonite-Luggage-Hyperspace-Expandable-Suitcase has a full featured interior. Inside includes a wetpak, mesh pockets and a floor to ceiling compression straps to keep clothes in place. A removable hanging toiletry kit is also included, for additional convenience while traveling. The soft sided case is expandable to fit all your belongings. The Traveler-Expandable-Carry-On-Luggage-Mustardis a 2 piece set. The first piece is 21X13.5X8.5 and expands to 10.5 inches. The second piece is a 14X10X6. The suitcase is small enough for a carry on at the airport, preventing the need for a checked bag. It is made from 100% rigid polyester construction with strong heavy duty zippers. The interior is fully lined with a mesh bag. 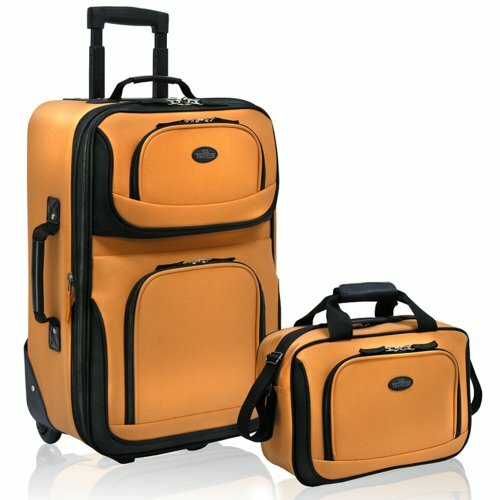 The Traveler-Expandable-Carry-On-Luggage comes in a Mustard color. It also comes with a retractable push button, self-locking handle for easy mobility. This allows you to roll the bag easily rather than carry the suitcase. Top and side handles make it easy to lift a packed bag. The 2 back wheels are in line skate wheels making them rugged and sturdy. The front bottom corners have corner protectors to stand up to heavy use and rough travel.